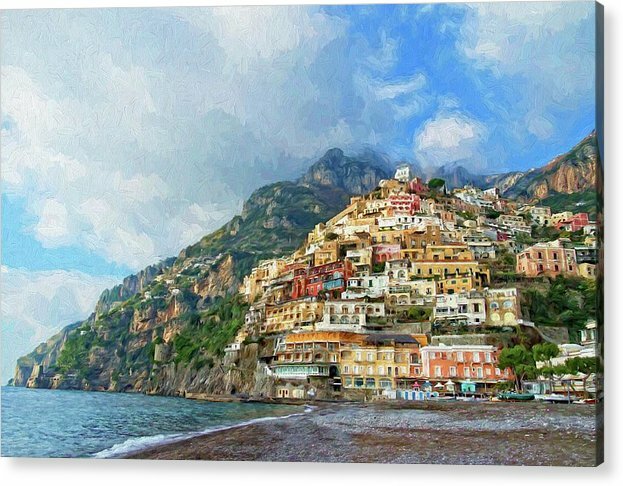 Positano Beach View Painting by Allan Van Gasbeck - 20.000" x 13.375"
Positano Beach View Painting acrylic print by Allan Van Gasbeck. Bring your artwork to life with the stylish lines and added depth of an acrylic print. Your image gets printed directly onto the back of a 1/4" thick sheet of clear acrylic. The high gloss of the acrylic sheet complements the rich colors of any image to produce stunning results. Two different mounting options are available, see below. 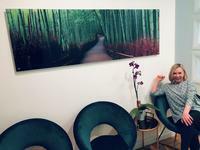 I am pleased to announce your Art submission has been chosen and is now Featured in DISTINCTIVE PAINTOGRAPHY. Your work exhibits excellence in the art of Image enhancement, Reproduction quality and Subject matter, Congratulations! 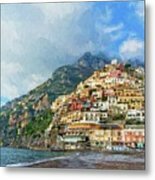 This image of Positano, Italy is a manually digital enhanced photograph designed specifically as a greeting card/note card. It was taken in February 2016. 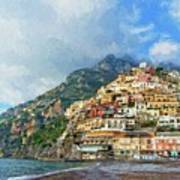 This view of the west side of town is from the beach area far below central Positano. 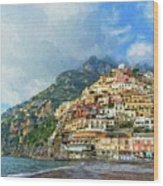 It is interesting to note that the Amalfi Coast Highway is slightly above this section of town. Featured in the FAA group Images That Excite You. Featured in the FAA group Travel Art. Featured in the FAA group The Artistic Aperture. 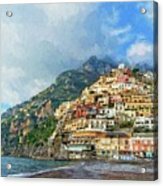 Featured in the FAA group Distinctive Paintography. 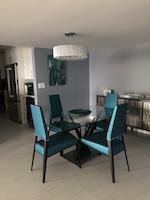 Featured in the FAA group Bedroom Art Gallery. Featured in the FAA group Art District. Featured in the FAA group Pictures For Present. Featured in the FAA group Coastal Scenes. Featured in the FAA group FAA - Pixels All Stars. Featured in the FAA group 10 Plus. Featured in the FAA group Balconies Windows and Doors. Copyright Allan C. Van Gasbeck, 2016 to the present. All Rights Reserved.